It's breakfast-on-the-go. A year-round treat. A healthy dessert. And it's taken America by storm. Now JoAnna Lund offers a wealth of original smoothie recipes--nutritious, healthy, and delicious--that can be made at home, simply and inexpensively. 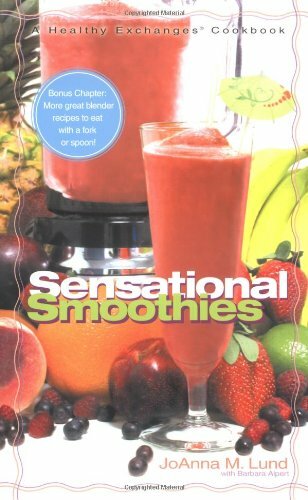 She shows readers how to create flavorful smoothies at home, the Healthy Exchanges way: low in sugar, low fat, and packed with nutrition. Includes the delicious Banana Flip, Orange Coconut, and Creamy Strawberry Daiquiri. Plus, there's a bonus section on getting creative with the blender featuring recipes such as Quick Chili con Queso supper or the No-Bake Blender Cheesecake.